Make your own custom dollhouse windows, or windows for any scale model buildings. If you learn to make windows following these instructions, you will save a lot of money on building projects as well as learn to create custom designs that suit your period or style. You can also use this method to copy windows to repair vintage dollhouses or model buildings. The windows shown in these instructions have been made with craft strip wood (bass or tilia/lime) but they can also be made with other hardwood strip wood. The windows can be fitted with a thin glass (try glass from old picture frames) or clear acrylic sheet. Many plastic shops sell plastic sheet (lexan or other types) in 1/16 inch thicknesses. This is usually sold by the foot. Some dolls house shops will also sell sheet plastic suitable for windows in the window section of their building supplies, ( Earth and Tree are one). The thickness of the walls of your room box or dolls house. Most commercial windows fit walls 3/8 thick, but there are some windows which fit narrower or thicker walls. The details you want on your windows - muntins or separators, curved muntins, crossbars, or other trims. Note: If you will be storing your dollhouse where it will be exposed to sunlight, make sure you choose a UV resistant plastic for your 'glass' which will not yellow in sunlight. Do not use real glass for windows in houses which will be played with by children. If you can't find thick enough plastic for windows, you can use thinner sheet plastic or recycled clear plastic packaging, just make sure you adjust the channels for your 'glass' accordingly. If you wish, you can use a heat embossing technique to mimic the effect of 'etched' glass for window and door projects. Here's an example of simple dollhouse shop front made with a fixed window. You can follow the linked directions to make a range of miniature shops using the basic windowbox instructions and the instructions for making opening shop doors. Understanding the Names of Parts for a Dollhouse or Miniature Window. Opening Sliding Sash Windows - Sliding sash windows use a double U-channel track on the sides or jambs of the window surround. The windows are in two parts and one slides up and down in one channel, while the other slides in the second channel. Sash windows can be plain or have muntins in various patterns. Opening Casement Windows - casement windows open outwards, instead of sliding up and down like sash windows. You can make casement windows that open inwards, but it interferes with the display on the inside of the dolls house. Sliding Windows - These are rarely seen in dolls houses, but you can make sliding windows with the same double channel material used for sash windows, or by custom cutting slots in wood with a router. Muntins - the narrow dividing sections of the window sash. Originally these held small pieces of glass together to form a sash. Now they are usually decorative and only found on one side of a window (the outside) making the window easier to clean. Casement Stop - the trim piece at the bottom of a window which prevents the window from opening into the room as well as out. The instructions which follow will cover two easy ways to make dolls house and model building windows using strip wood. You can also substitute card, wood veneer or photo paper for windows in smaller scales. Both methods have advantages and disadvantages. This is a method often seen in commercial windows. U-channel molding (sometimes sold as miniature sash molding or dollhouse window or shutter molding)is a routered commercially available molding available from many dollhouse supply shops, which can be used to surround your 'glass' to make easy window sashes. The U-channel molding is available as single or double U-channel (double, for sliding bypass sashes is very hard to find), and as double or singled edged channel molding. For this project, I will show the single edge, single channel molding used to make window sashes. You can use double-edged U-channel molding to make windows that look like traditional sash windows, but which don't open, or you can use double channel molding (if you can find it) to set your single sashes in to make traditional sliding sash windows. If you want your windows to slide, make sure the U channel you use will fit into space in a double U-channel trim. If they are made by the same manufacturer there should not be a problem. To make window sashes with U-channel moldings you simply cut the molding and glue it around your window 'glass'. This method works best when you have a thickness of window glazing which fits neatly into the channel in the molding without being too thick, or too thin. You must be careful not to break the thin edges of the channel molding while you work with it. Your window dimensions will be the size of your glass, plus the size of the 'back' of the U channel (the depth back from the U). For hinged casement windows, add 1/8 inch extra space on the hinged side of the window between the window sash and the window frame. For double windows add 2 x 1/8 inch or 1/8 inch for each window. There were some suppliers in the U.K. who offered different styles of window sash molding, including moldings for sliding Georgian sash windows. You should check suppliers to see if they have moldings which are designed for particular house periods. If you have access to a router, you can also make your own U-channel molding with simple router bits. To make your window sash, cut your plastic window the size of your window frame (for a nonopening window) minus twice the depth of the back of the U channel for each direction (height or width) of your glass. Cut the U channel to fit your plastic when you are sure the plastic is square. It is best to cut the U channel with square ends and cut the rails at the top and bottom of the window sash so they fit inside the side pieces. Set the window glazing inside the U channel and glue the channel pieces together. Clamp the window sash until the glue has dried. You can add muntin strips or dividers to dolls house windows in a range of decorative patterns. It is best to apply the muntin strips only to the outside of the window as it makes cleaning the tiny windows much easier, but you can apply the strips to both sides if you wish. I have shown the muntin strips unfinished in this project, but you should paint them the color you want them to be before gluing them in place to save yourself a lot of cleaning and detailed trim work! If you are going to add muntin strips to a window, choose a piece of wood trim which is roughly 1/2 inch to 3/4 inch in scale. Fine wood strips suitable for dolls house muntins are available from model ship lumberyards You can also use decorative sticker strips available from scrapbook suppliers, similar to the strips used for making stained glass. If you must, you can paint these sticker strips while they are attached to their backing sheet. I used wood muntin strips on these windows which are roughly 1/32 inch square. The thickness of your muntin strip should not stick up above the edge of your window sash material. If you need to use thicker muntin strips, custom makes your windows from strip wood so your sash material can be thicker than is available in the U channel. Once you have your muntin strip trimmed, glue it in place on your window. I usually only glue the edges where they meet each other or the sash, I don't glue the strips to the glazing. As thin strip wood is easy to bend when it is damp, you can also create curved muntin strips fairly easily. Allow the damp wood to dry before trimming it to size. Note: if you want to have diamond pane windows, one easy way to achieve the pattern is by using printable decals and your computer printer. See the linked instructions for photos of a sash window with diamond panes in the top section. Cut your frame pieces to hold whichever style of window sash you have built. Glue the frame together, clamping it to hold it square. Check that your window sash will fit into the frame, and that the window sash is not too thick to fit the frame! The simplest and easiest way to make a durable hinge for a dolls house window or door is to use a sturdy dressmakers pin, cut to the correct length. To measure the correct length, choose a drill bit the width of your pin stem, checking that the drill bit will fit into the edge of the sash without danger of drilling out of the edges of the sash or destroying the section of wood at the edge of the sash. Use the length of the drill bit to determine how long a pin you will be able to set into your window sash. The pin should be slightly longer than the drill bit, plus the length the pin will need to get through the window frame and into the opening window. Use wire cutters to trim the pin to the correct length, and if possible, use a metal file to sharpen the end of the pin so it will pierce rather than risk splitting your wood when the pin is inserted. To fit the dressmakers pin into a dollhouse window (or door) to act as a hinge, lay the window (or door) frame on a flat surface with the top of the window frame facing you. Set the window sash into the frame and note which will be the front edge of the window (the one touching the flat surface). Take the window out of the frame and use a sanding block and fine sandpaper (or an emery board) to sand the front corner of the window sash around where the side of the sash will come up against the window frame. Rounding this edge will allow the window to swing out on the hinge pin and not stick against the door frame. Set the window sash back into the window frame and use a folded piece of paper or scrap of wood to 'shim' it away from the edge of the frame by 1/8 inch (or a bit less, depending on the scale and thickness of the window sash, thicker sashes will need more of a gap). Take a miniature drill and carefully drill straight through the window frame and into the edge of the window sash making sure you are drilling into the wood at the edge of the glass. Some people prefer to drill the hole in the sash first, then drill through the window frame to meet up with the hole in the sash. Keep your drill square and straight so your hole is straight into the wood on the window sash. When you have drilled all the way through, test fit the pin into the sash. It should reach almost down to the bottom of the hole, but the pin should protrude slightly from the outside of the window frame. Repeat the process on the other end of the window. Note: If you are making a double casement window, check that both sides have the same gap between the sash and the sides of the window frame before you drill the holes for the hinge pins. It is a good idea to shim both windows in place and then drill, so you don't end up with a larger gap on one side of the window assembly, and so you check that your window will meet in the middle evenly. With all the pilot holes drilled, insert the shortened dressmakers pins into the edges of the dollhouse window sashes. Once the pin is in the hole, turn the window so it is facing up and press down gently on the pin that protrudes from the bottom of the window frame, repeat on the top of the frame. The pins should fit into the window sash and be flush with the top and bottom of the window frame. Check that the window meets the outside edge of the window frame evenly and that the window opens outwards without sticking. If there are problems, pull out the pins and sand the edges of the window some more. When the hinges work correctly, glue the top of the pin to the frame at both the top and bottom of the window. Once your dollhouse windows are hinged correctly you will need to stop them from swinging in the wrong direction. To do this take a narrow strip of craft wood wide enough to run from the back of the windows when they are closed in the frame, to the back of the window frame (see photo). Glue this strip to the bottom of the window frame (the sill)lining one edge up with the back of the window in the closed position. Leave to dry. If necessary sand the strip even with the back of the window frame. This stop strip will allow the window to open forward but will prevent it from swinging back into the room. If you don't have access to a router, or don't want to use the standard u channel molding to hold your window glazing, you can build custom dolls house or miniature building windows out of strip wood in a method similar to the one used to build dolls house doors. For this method, you build a 'sandwich' on all edges of your glazing to hold it securely in place. To make windows with this method you will need strip wood which is as thick as the plastic or glass you are using for your windows, and at least 1/16 inch narrower than the strip wood you want to form the window sashes (the thickness of wood you want to see around your window). For my window, I used 1:16-inch thick Lexan material for the glazing, so I used 1/16 inch square stock to surround my window and overlaid that with 3/32 inch strip wood to make a narrow window surround similar to modern casement windows. I was intending to use brass dollhouse hinges to show you how this method will work with hinges, so you need the width of your sash to be wide enough to almost cover the width of the hinge on one side, not quite as far as the hinge pin. If you want to use this method with regular pins for hinges, you may want to use a piece of wood to enclose your glazing which is slightly thicker than 1/16 of an inch, at least in the direction widthwise to the plastic glazing. Begin by cutting your window glazing to the size you need. For this type of window, the sash width will be equal to the width of the wood you surround the window with x 2 (for both sides) plus the width of your glazing. When you have your window glazing cut to size, cut the wood you will use to surround your glazing to fit neatly and tightly around the window as shown. Glue the corners together, keeping the window glazing free of glue. Clamp the window until the glue sets. If your plastic came with protective coating film, leave the film in place. 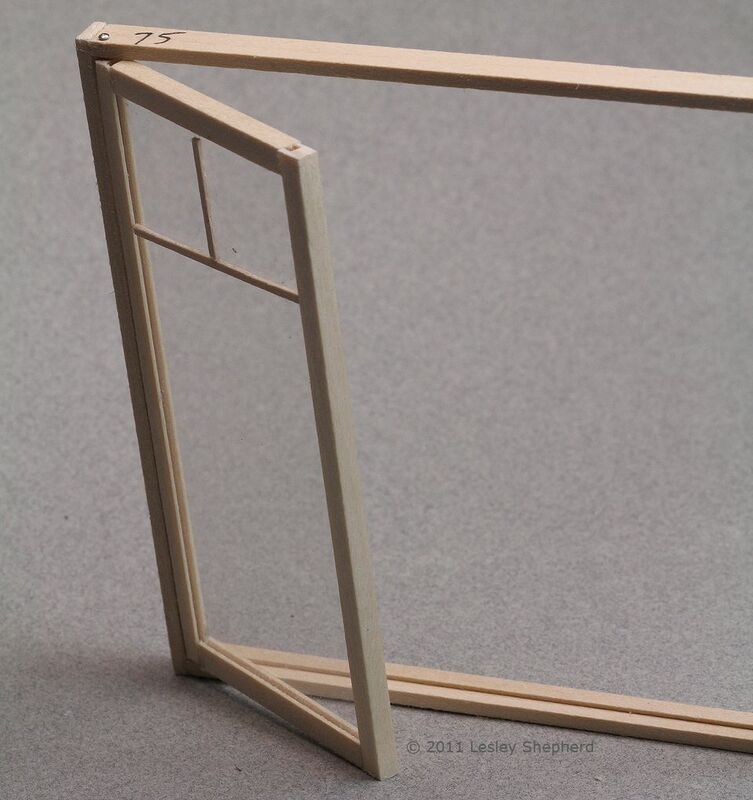 This type of miniature window sash can also be made in smaller model scales using the card, or wood veneer. Once you have the wooden or card surround built around the window glazing. Take the widths of strip wood or card you want to use for the sash front and cut the strip wood so it will line up with the outer edges of the glazing surround when you lay it over the window. If you want to place muntins or bars/dividers on your window, choose strip wood for the outer sash which is as thick as the material for your muntins. This should give you a frame which has a recess on the inside to accept your glazing, but which covers the edges of the glazing to hold it in place. Glue the sash pieces to one side of your window sandwich, leaving your glazing material free. Set the window sash with the wider pieces down on a flat surface, preferably clamped, and leave the sash to dry. You fit hinges to the window sash using the same method used for fitting fabric or plastic hinges in smaller scales on dollhouse or model doors. This holds hinges more securely than the tiny 'nails' supplied with them. For smaller scale windows, you can use hinges made from fabric, flexible plastic or thin leather rather than metal hinges. If you are making fixed windows or sliding sash windows you don't need to apply hinges. If you prefer, you can use the hinge pin method shown with the U channel window sash. When you have a nice square frame remove the protective film from your glazing and fit it into the recess in the center of your window sash frame. If you are using dolls house hinges, mark the position of the hinge against the wood or card that surrounds the glazing, and cut a small recess into the wood to accommodate the side of the hinge. If your glazing gets in the way, mark the hinge recess on the final piece of sash material that you will glue in place over the window, and trim out the area where the hinge will fit. If you don't trim away a bit of wood to allow the hinge to fit into a recess, you won't be able to glue the final piece of sash trim over the window sash assembly. When you have cut out the recess for your hinge, check that the hinge doesn't show on the window side. Use epoxy glue to set the hinge in place, and glue the final pieces of the sash to the wood or card which surrounds the glazing. Clamp the final sash pieces over the hinge and leave the epoxy glue to set up. I usually glue in the hinges before I glue on the remaining three sides of the window sash. Note: If you are making custom windows in smaller sizes, you can make your own hinges from scrap metal or thin brass stock. The instructions for making miniature hinges will show you how to make smaller hinges than most metal hinges you can buy. This method will also work for making custom shaped hinges. Remember that miniature hinges don't support the weight of wider doors or windows easily. Once the dollhouse hinges are secured to the window frame by the glued sash strip, finish the other sides of the dollhouse window sash and leave it aside to dry. When the sash is dry, make a window frame as shown in step five. Do not glue the frame together until after you have cut out a thin space for the hinge. Use masking tape to hold the pieces together while you mark the sides of the hinge. Set the window so the hinge barrels protrude from the window frame at the front of the window. Mark and trim out the window frame side near the hinge to set the side of the hinge neatly into place along the window frame edge. Assemble the window frame. With the frame assembled, lay the frame down on a flat surface and set the window sashes inside the frame. Shim up the windows away from the surface if the hinge barrels get in the way of the window sash laying flat against the flat surface. Shim up the window frame if you need space for the protruding barrels. You want the front of the window sashes to match the front edges of the window frame. The ones laying on the flat surface. When everything is in place, set the free edges of the hinges up against the sides of the window frame in the slight recesses you cut for them. Glue them to the frame with epoxy cement which is the only secure way to hold metal to wood. To finish the window framing, glue a thin piece of strip wood over the sides of the hinges, covering them a bit back from the barrel of the hinge and holding them more securely, sandwiched between the strip wood and the window frame. Set aside to dry. When the window hinges are secure, cut a piece of strip wood to set the base of the windows as a casement stop, the same way it was done in step nine. Notice the difference between the window on the left, built of U-channel molding and hinged with pins and the window on the right (made of strip wood and hinged with dollhouse brass hinges. I intentionally cut the window glazing the same size to show you how differently sized the windows may be depending on the wood you use to make the sashes. The window sash built from strip wood is much narrower than the one built from the U-channel, which is why the window is too short for the frame. Experiment with the size of wood, the muntin patterns, and other aspects of miniature windows to work out the style you prefer. When you have built your miniature windows, you can set them into an opening and trim them with your choice of moldings to fit them into the design style of your house or shop.